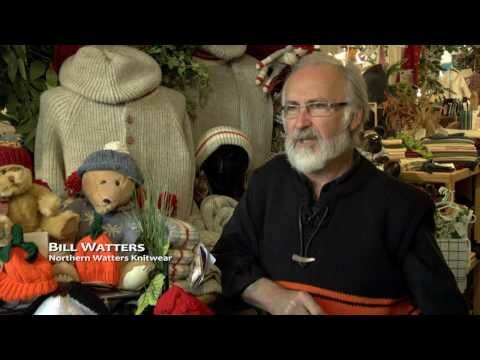 At Northern Watters Knitwear, we use antique Swiss Knitting looms which allow us to produce a woolen product of exceptional craftsmanship. From start to finish, depending on the detail of the pattern, a sweater can take up to 8 hours to create. We use 2/8 worsted spun British virgin lambs wool. Our product line uses two strands of yarn. Our heavy weight, super warm line uses three ends of yarn. The fully fashioned panels produced on the knitting loom are laid on a steam table. The steam "sets" or pre-shrinks the yarn. The panels are then measured for size. The skill of our knitter on the loom ensures a perfect piece. The panels are then assembled by stitch per point linking using the same yarn the knitters used while knitting the piece. All the yarn ends are darned in to finish each piece. Our buttons are made of Natural Wool, which are carefully selected for each button styled sweaters. High grade Canadian made zippers are used for zippered sweaters. We take pride in sewing our name on each of our products. Step 7 is the second and final steaming of the finished product and this is where the quality control process is again checked. Hand tags with care of the product are then attached to the finished piece which includes the signature of the knitter.